C. Streeter, 'Two Carved Reliefs by Aubert Parent', The J. Paul Getty Museum Journal, Vol. 13, 1985, pp. 53-66. 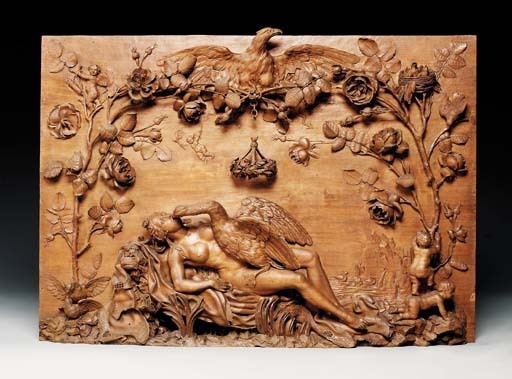 Aubert Parent's delicate and lively wood carvings, as seen in the elaborate flowers, birds and birdnests framing the central scene of the present piece, have been widely praised for their faithfulness to nature and for their elegance. One contemporary, seeing a work in the 1780 Paris Salon, commented that 'the birds are as natural and as lively as they are in nature' (op. cit., p. 53). The scene under the canopy of foliage shows Jupiter seducing Leda in the guise of a swan. On the right and climbing in the roses are the offspring of the union: Helen of Troy, Clytemnestra, and the twins Castor and Pollux.